Demand for data storage is growing exponentially, but the capacity of existing storage media is not keeping up. Using DNA to archive data is an attractive possibility because it is extremely dense, with a raw limit of 1 exabyte/mm3 (10^9 GB/mm3), and long-lasting, with observed half-life of over 500 years. 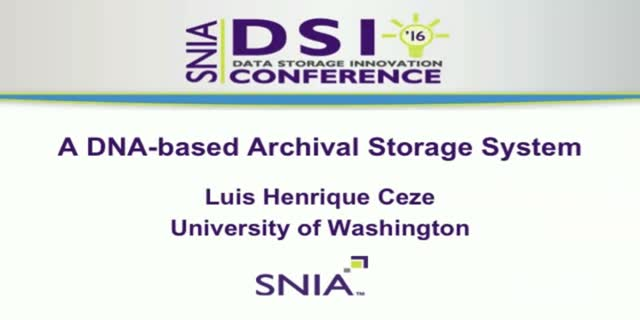 This work presents an architecture for a DNA-based archival storage system. It is structured as a key-value store, and leverages common biochemical techniques to provide random access. We also propose a new encoding scheme that offers controllable redundancy, trading off reliability for density. We demonstrate feasibility, random access, and robustness of the proposed encoding with wet lab experiments. Finally, we highlight trends in biotechnology that indicate the impending practicality of DNA storage.